The below is a quote about the Laguna Seca model. It appears there may be "hidden" extra that is yet to be revealed. My speculation is the difference will be a big horsepower boost. If the engine is the same as the 302R which I believe makes 450+HP through the restrictors then Ford is holding back on the HP and RPM in some manner most likely as a part of warranty considerations. There has been talk of a red key. Maybe the LS will come with a key that has some type of encryption (or a different ECM) that would allow the engine to operate at full tilt but void the warranty if used? Key-on engine has an 8400 redline and makes 475-500HP? "Balance is the key on Boss, and even more so on Laguna Seca," said Pericak. And below, Jay Leno forgot he wasn't meant to mention anything about this key. Watch from around 4:35 and you'll see what I'm talking about. 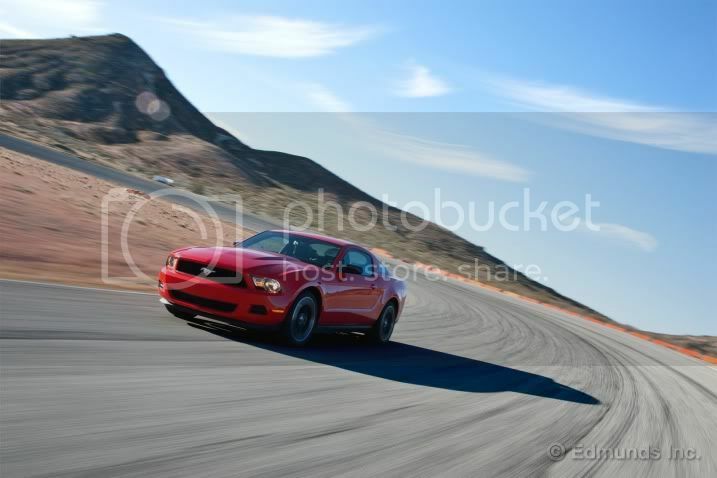 Right at the end you will appreciate the noise this makes. .
That the 2012 Ford Mustang Boss 302 Laguna Seca is a track car is no secret. It is, after all, endowed with all the conspicuous wares of such purposeful duty: a massive front splitter, larger rear wing, R-compound tires and no backseat. This car looks the part from bumper to bumper, leaving little question about its purpose in life. And the fact that it can be driven to the track in relative comfort, beaten on for a day and driven home is just gravy. This, however, you already know. But there are other questions to be answered. Like, say, whether the stock Mustang GT can survive such duty. Whether the V6 Mustang is as out of place on a track as an opossum in a swimming pool. And the real meat of the matter: whether the Boss can stand and swing against the master of all Mustangs, the 2011 Ford Shelby GT500. 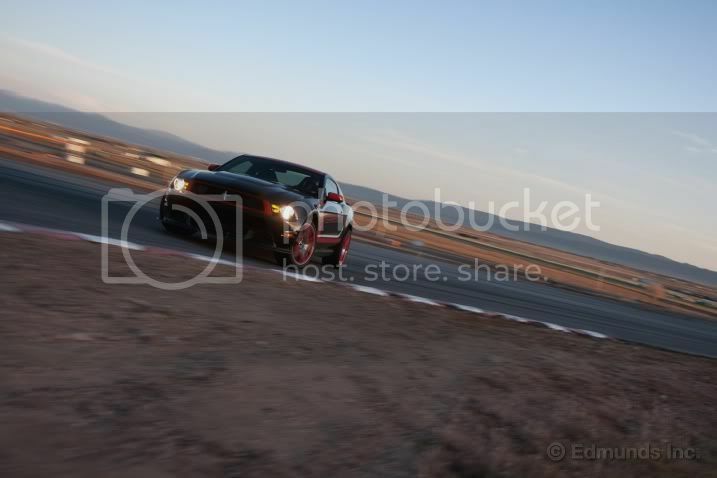 To find out, we gathered every hardtop Mustang that matters and marched them from racetrack to racetrack, stopping at both our usual test track in Fontana, California, and at the Streets of Willow Springs, a 1.6-mile road course in Rosamond, California. It is true that we don't love the hype surrounding the V6 Mustang. For us, the lesser model of a performance car will always sing a certain inauthentic tune despite its efficiency or styling. But make no mistake, driving a V6 Mustang in 2011 lacks the sting it did in, say, 2009. For $28,690 you take home a reasonably quick sport coupe that is graced with genuine performance parts. There are 305 legit horsepower and a six-speed manual transmission, while the optional Performance package adds the same sticky 255/40ZR19 Pirelli P Zero summer tires as the GT along with a limited-slip differential and a 3.31 axle ratio. Also included are unique front and rear brake calipers and more aggressive brake pads. It chortles along at full throttle, making a sound only a housewife could love, but this is a decent car. And when measured against its more powerful and more expensive stablemates (come on, we had to say it once), there's a good value statement here. In straight-line testing, our V6 Premium model hit 60 mph in 5.8 seconds (5.5 seconds with 1 foot of rollout like on a drag strip) and completed the quarter-mile in 14.1 seconds at 100.3 mph. It produced identical lateral acceleration to the GT at 0.93g — impressive territory for any car in this price range. Its slalom speed, at 67.3 mph, was the slowest of the group by a large margin — proof that power matters in this test. 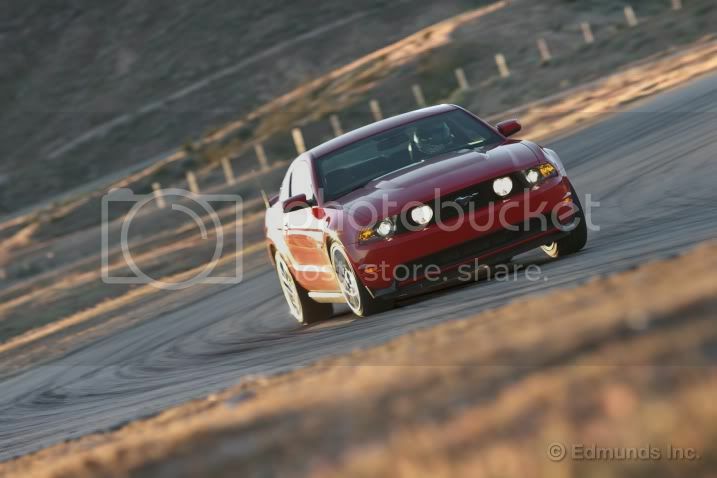 We'll admit it: Driving a V6 Mustang around a road course feels a little like taking Mom's Buick to the senior prom. It'll get the job done adequately, but you're not going to love yourself when it's over — and neither is anyone else. Still, we hooned lap after lap in the V6 and came away duly impressed with its final time of 1:30.9 — only 2.7 seconds slower than the GT. But the real story is its peak speed of only 98.2 mph, achieved on The Streets' back straight — the same place where the GT hit 108.0 mph. This 9.8-mph speed differential — easily the largest between any of the cars — is telling. This, friends, is called a momentum car. Lacking the power to compensate for mistakes, it simply grips its way to a decent performance. But at 3,496 pounds, only 119 pounds lighter than a GT, the V6's brakes aren't going to survive a day of ten-tenths lapping. The pedal goes soft fairly quickly (but never let us down completely) and the steering wheel shakes under heavy braking. This is a car that can be driven quickly. It's also fun and balanced, but don't plan on repeated lapping with stellar results. With the reintroduction of the 5.0-liter engine for the 2011 model year, Ford officially reinstated the Mustang GT as a genuine performance car. And the chassis, despite its solid axle, not only makes the numbers but is the most rewarding pony car to drive quickly. Slap on the Brembo Brake package, which adds four-piston Brembo calipers up front and 14-inch rotors as well as the aforementioned 19-inch Pirelli rubber and you've got a Mustang with some authentic lapping hardware. Real gearheads opt for the 3.73 axle ratio to get down the drag strip as well. This hardware, plus a few other items (rear video camera, electronics package and HID headlamps), pushed the price of our test car to $39,680. For that sum you get a 412-hp four-cam V8 good to 6,750 rpm and a six-speed manual transmission in a car weighing 3,615 pounds. In our tests, it's good for zero to 60 in 5.2 seconds (4.9 seconds with rollout). We saw a 13.2-second quarter-mile at 109.3 mph from this GT — slower than others we've tested. But its handling numbers were solid: 70.3 mph between the slalom cones and 0.93g lateral acceleration. Between the GT's wide power band and its low final-drive ratio, there's ample flexibility on the road course. We found ourselves experimenting with 2nd or 3rd gear in certain corners but usually settling on the higher gear just to save a shift and, hopefully, some time in the process. With a broad shelf of torque starting at about 3,000 rpm, there's no reason to fear falling off the torque curve even if you find yourself a gear too high. And that's probably the best part about lapping a Mustang GT — there's always enough motor to make the chassis do what you want. Multiple full-bore laps will overheat the tires and slow the party some, but that just means extra attention to the throttle exiting corners. At the end of the day, the GT's 1:28.2 lap puts it right where we expected — a few clicks quicker than the V6 and a few slower than the Boss. You know the Boss 302's tweaked 5.0-liter is good for 444 hp at 7,500 rpm and you know it's got extra exhaust outlets just to add to the experience. 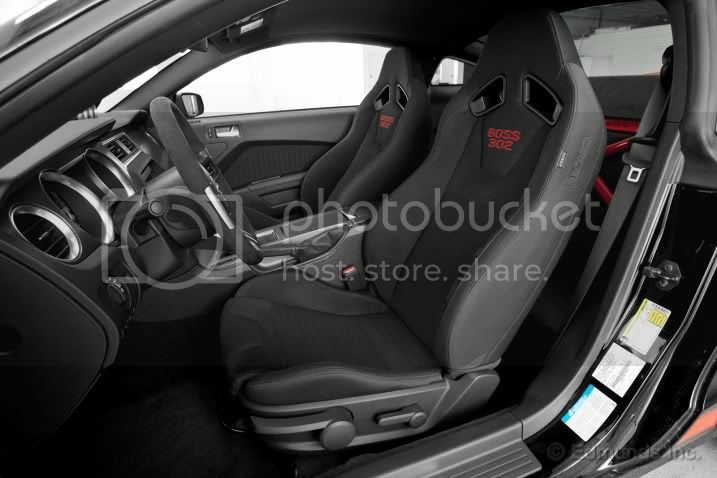 There's a six-speed manual transmission and a 3.73 rear end with a Torsen limited slip with the Laguna Seca package. Opt for that package and you'll get all the go-fast hardware we mentioned above. And you'll pay $47,990. What you don't know is that it's worth every penny. We're not going to pretend $48,000 isn't a lot of money for a Mustang. It is. Actually, it's a lot of money for any car. But it's not so much money that it's wildly out of reach. When it comes to cost, this is still far from Corvette ZR1, Mercedes-Benz SLS or Porsche GT3 territory. But when it comes to driving reward, the Boss gets you 90 percent of the pleasure and most of the speed for half the cost. In this test the Boss hit 60 in 4.6 seconds (4.3 seconds with rollout) and crushed the quarter-mile in 12.7 seconds at 113.4 mph. 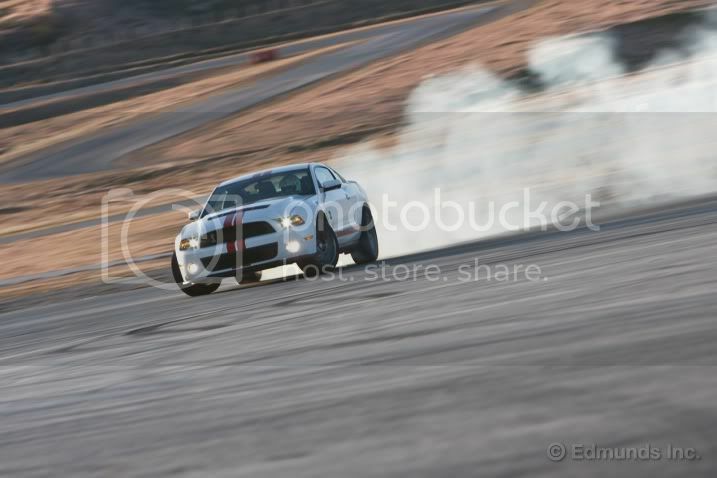 It circled the skid pad at 0.98g and slashed through our slalom cones at a full 72.0 mph. And although the Boss makes outstanding numbers, the reason for its greatness has nothing to do with them. There are few automotive experiences more rewarding than winding this machine around a proper road course. This car's combination of a hugely flexible engine, a chassis that's as capable as it is durable and a sound that is unmatched is as good as it gets. Plus, it's American and it's relatively inexpensive. Its Getrag six-speed begs for quick, deliberate shoves between gears, its engine is truly alive above 7,000 rpm and there's ample thermal capacity in its brake package. The Boss is magic as its limits approach. It will flirt with oversteer while still communicating its every intention. It's like there's fairy dust in its big Pirellis, magic in its steering and pure smiles under its throttle pedal. This is the Mustang we've always wanted. With a 1:26.1 lap time it's faster around this road course than a $55,720 Corvette Grand Sport and close enough to the GT500 to make Ford sweat. 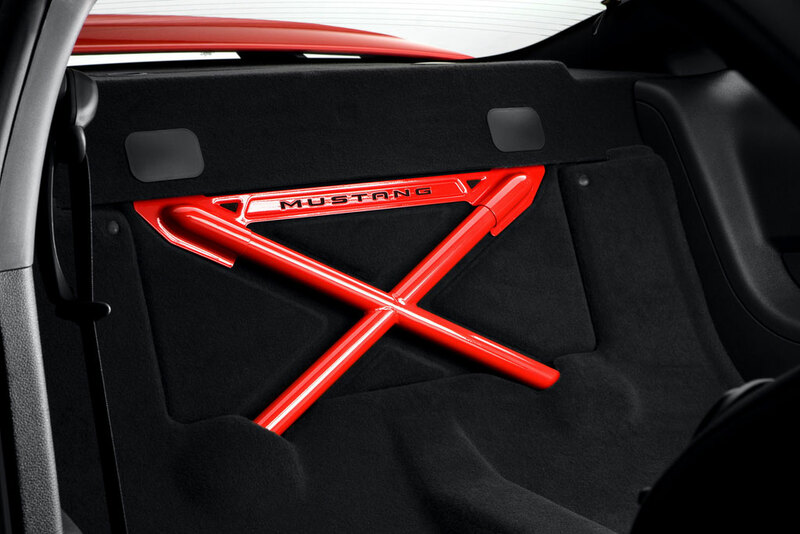 Ford's big sword in the Mustang quiver, unsurprisingly, gets a Shelby label. There are 550 supercharged horses and a six-speed manual transmission. Check the box for the SVT Performance package and you'll get staggered (19-inch front, 20-inch rear) wheels, Goodyear Eagle F1 Supercar G:2 tires and a 3.73 final drive and limited-slip axle. Add in the electronics package and you're looking at a $55,330 Shelby. We've stood beside the Shelby's impressive numbers before, but we've also driven GT500s with transmissions so thrashed that shifting them quickly was impossible. Such is the case with this 10,000-mile-old press car. The slow 1-2 shift added measurable time to the Shelby's 0-60 milestone, which we measured at 4.6 seconds (4.4 seconds with rollout). The quarter-mile traps were gone in 12.6 seconds at 115.8 mph. The huge (265/40ZR19 front, 285/35ZR20 rear) rubber helped the Shelby turn 0.99g on the skid pad and do 70.1 mph through the slalom. Let the big Shelby loose on a track — even a small track like Streets — and you're in for some fun. There's enough power here to generate wheelspin in 3rd gear exiting some corners, despite its fitment with the best tires on any Mustang. We saw a 112.3-mph peak speed on the back straight, which is 1.6 mph quicker than the Boss (110.7 mph). It manages its 3,808-pound as-tested weight admirably, but it's obvious from behind the wheel that there's lots of weight moving around here (186 pounds more than the Boss). Driving the Shelby quickly is work. It's fast and it's fun and it doesn't truly make any missteps, but it's the most work in the group. And with a 1:25.6 lap time, it's also the quickest. None of these cars will embarrass themselves on a racetrack if you respect their limits. In the V6 that means remembering you don't have Brembo brakes and driving accordingly. But really, this isn't the car you buy if you're planning to drive hard. Yes, it's unexpectedly rapid but not all that satisfying. In the GT, sure, the tires get greasy, but it's a genuinely fun car with the power and poise to be engaging in every way that matters. Heck, we even had an honest road race between this press car and our long-term GT 5.0, just to see what would happen. What happened? Well, we had a lot of fun. Nothing melted (well, OK, the tires got hot). Nothing overheated. If we were spending our own money we'd get the base car with the Brembo package for $32,190. That gets you all the go-fast hardware you'll need to have this kind of fun and skips the costly electronic frippery in our test car. 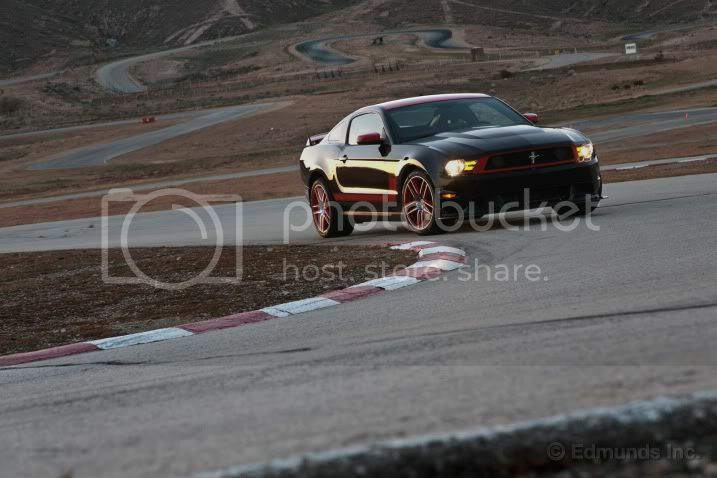 The GT500 is quickest. And it's a beast to drive. It's fun in its own way and it never makes any real missteps either thanks to a well-tuned chassis that backs up all that motivation. But in the end it's an acquired taste and our tastes lean toward the less costly, less powerful Boss 302. That's right, the Boss is the most serious driving tool here. It's like the GT turned up to 11 with an injection of testosterone just for fun. This is a serious machine with all the hardware to get it done lap after lap, save one: the tires. We delaminated the left rear P Zero Corsa after 12 or 15 laps. Perhaps the GT's rubber is a better choice, but we did witness these same Corsas survive repeated laps at Laguna Seca only weeks earlier. It could be an anomaly. Either way, for the money, there are few sleds that will run with the Boss. And there aren't any that are as rewarding, the Shelby included. There was a time not long ago when there was only one Mustang we'd consider taking to a track. That there are three legit choices with which to tackle a road course is a sign of just how seriously Ford takes the Mustang these days. That we'd choose the slightly slower but more focused Boss 302 over the more powerful GT500? Well, that's why we drive the cars. The manufacturer provided Edmunds these vehicles for the purposes of evaluation. Ford has unveiled a special lightweight concept at the Performance Racing Industry Show in Florida called the Ford Mustang Boss 302SX. The concept exudes a track-focused attitude, with various performance revisions over the standard Boss 302. It’s just a concept at this stage, but the 302SX has already kicked up quite a stir in the US. It features a new front bumper with a lower front spoiler, as well as an aggressive vented bonnet with a racy, go-fast stripe down the middle. At the back there’s a new adjustable wing for optimum on-track downforce, and a revised rear bumper incorporating the outlets for a Ford Racing exhaust system. There’s also set of lightweight 18-inch alloy wheels wrapped in racing tyres. Ford has added a fully adjustable coilover suspension kit with adjustable sway bars and camber/caster plates, a set of tubular control arms, and a full roll cage. A set of Brembo brakes is also added to complete the track-ready package. Engine performance has been increased from the standard 5.0-litre V8′s output of 331kW to over 373kW (500hp). There are no plans for the 302SX to go into production, however Ford is monitoring the reaction of consumers. If enough interest is expressed, a limited number may hit the market. Boss 302 Vs Mustang GT. Okay, swearing in the subtitles so hide the kids. He should be more relaxed now.